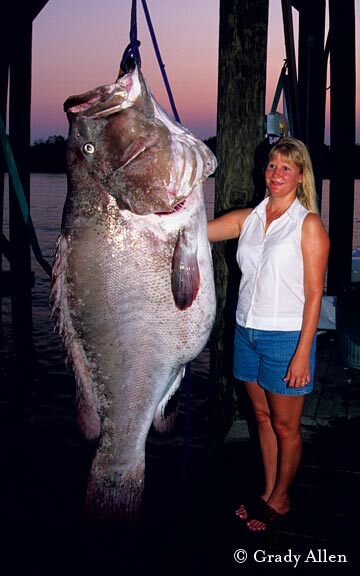 The fish just keep getting bigger—and meaner—as you venture into the deep waters of the gulf. For all of us who will never have the chance to see outer space, there’s an earthly option that’s infinitely more available and, at least to the ­uninitiated, almost as exciting. Pack some stout fishing tackle, high-powered sunscreen and a broad-brimmed hat. Load an oversized ice chest with fresh, ­waterproofed snacks, as much crushed ice as will fit into that one big cooler and then yet another, along with a case or three of bottled water and a dozen fresh oranges. Just for insurance, stash some motion-sickness meds in your travel bag. Then climb aboard a large, seaworthy boat with a knowledgeable skipper, brace yourself mentally and physically, and head offshore. Way offshore, peering over the gunnels throughout the voyage as the saltwater shifts like a wet-skinned chameleon from green to aquamarine to bright blue and then, finally, to a surrealistic shade of electric cobalt, where the boat, suddenly tiny, enters a featureless and deceptively barren world where life as we know it rests somewhere under the horizon and the only landmark in sight is a rusting, faraway freighter with an exotic-sounding name. Then wonder how an unthinkably vast universe this rarefied and untamed can be located closer to your home than a two-county road trip. Sound like an exaggeration? No problem. A single blue-water adventure usually erases any doubts. Imagine, for example, a panicked pod of flying fish launching from knee-high swells while a pack of yellowfin tuna savagely tightens the gap on its morning meal. A 10-foot marlin flipped upside-down three feet in the air with a half-dead bonita bouncing off its bill can make a lasting impression as well. Then again, maybe you’d prefer a 12-foot-long hammerhead shark homing in on your hull with all the subtlety of a half-ton torpedo. I’ve seen all of this since my first offshore fishing trip out of Freeport in 1972. Before my Gulf of Mexico angling days are done, I hope to witness much more. Once blue water gets in your blood, it’s tough to get out. I will, however, gladly skip another hammerhead run-in. That particular drama concluded a rod length away from the transom with the agitated beast still fixated on slam-dunking a very hastily retrieved lure. It’s no wonder that ancient mariners’ ocean maps were emblazoned with dragons. Magellan and crew had never imagined, much less seen, anything like the dinosaurian denizens of the open sea. Then again, to this day, neither have millions of others. Not all Gulf of Mexico sport fish are quite so dramatic. None, on the other hand, are boring, either. Texas offshore fishing is a mission to parts unknown, an adventurous quest for sights and species unseen, and with a basic set of fish-finding skills and adequate equipment (or better yet, a veteran captain with both), a fish-induced whipping waiting to happen. Out on the blue water, foot-long fish make great live baits. Saltwater bay fishing is popular largely because of its variety and unpredictability. In deep Gulf of Mexico waters, those two factors are exponentially magnified. Everything — the typical boat, the immensity of the water, the required fishing tackle, line and leaders, and of course, the fish themselves — is bigger. As for variety, the standard cast of characters that typically occupy the crevasses and shadows of deep-water rocks and wrecks is, pardon the pun, hard to fathom. It’s fairly common for weekend anglers to capture species they can’t identify without the assist of a field guide. 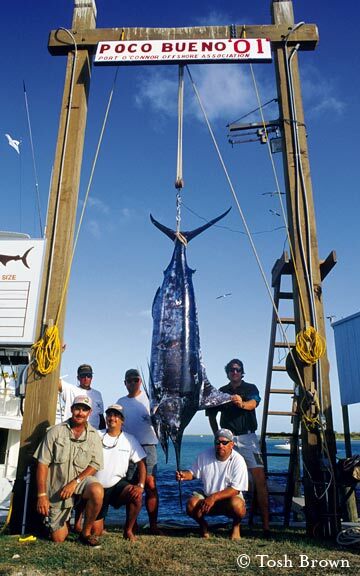 Usually, though, the gulf’s most popular sport fish species are anticipated catches. Each one is distinct and, without exception, fun to fight and good to eat. They aren’t called “kingfish” for nothing. King mackerel are the most popular offshore fish in Texas, a ranking earned from several characteristics. Compared to other highly sought species, kings are relatively plentiful. They’re generous with strikes, too, attacking everything from drifted dead ribbonfish (Atlantic cutlassfish) and freshly thawed sardines to briskly trolled lures and a variety of live baits. Trophy-caliber kingfish specialists are partial to the latter. The size of live baits used for king-sized kings has grown proportionately with the swelling popularity of modern-day kingfish tournaments that reward the winners with lucrative cash payouts. Anchored shrimp boats “culling” their bycatches are kingfish magnets. Many more of the sleek, sharp-toothed predators are caught near oil rigs and from atop the fringes of GPS-logged bottom structures. A kingfish hooked on anything but a steel or coated steel leader is likely to cut the line before the fight begins. Fish in the 15-pound class are common. Any king heavier than 40 pounds is a catch to be proud of. High-speed hitters, kingfish intercept baits on the run and then usually make two or three determined, line-stripping surges before they succumb. Table quality depends upon post-catch handling. Promptly bled-out, smaller king mackerel do any grill justice. As with all fish, just don’t overcook it. Take one part shark and one part catfish and convert it into a swimming muscle. With their shark-like bodies, catfish-shaped heads and cat-like curiosity, ling are as powerful as they are capricious. The shade-seeking fish gravitate toward oil rigs, anchored shrimp boats and most anything else that casts a shadow. I’ve seen ling make ambush points out of floating tarps, drifting sheets of plywood, rusty oil drums and even a bobbing 5-gallon bucket. Ling are often seen before the first cast is made. The sheer anticipation of sight-casting to a 50-pound cobia triggers major-league jitters, and constitutes much of the challenge and fun. Getting one of the inquisitive fish to take a bait or lure commands a delicate mix of finesse, persistence, and yes, sometimes plain old fishing luck. Ling are finicky creatures. The fish tend to roam in small pods. Getting the biggest one to take a bait before it’s snatched by an overeager youngster can be extremely frustrating. The ling is a dogged and persistent tackle-busting battler with absolutely mind-boggling stamina. As for its culinary appeal, the ling’s firm, light-pink flesh is ideal for all cooking styles. Do not gaff these fish and bring them aboard before they’re as exhausted as you are. Even then, get the fish into an adequately sized ice chest post-haste, and sit on the lid until the thundering whacks of its powerful tail and rock-hard head begin to subside. A “green,” prematurely-gaffed ling, given the chance, will break everything on the deck. That includes not only tackle, but also legs. Plus, it sounds cool … which, considering the species, is entirely appropriate. Stoked-up dorado are flashier than Peter Max posters. Yellow is the predominant color, highlighted by shades of blue and pink that, like billfish, vividly “light up” when the fish are excited (no fluorescent black light required). Many marine biologists believe dorado use this characteristic to confuse nearby baitfish immediately before attacking. Whatever the reason, it’s an unforgettable sight. So is the fight. The dorado is an incredibly enthusiastic jumper. Smaller specimens, commonly called “chicken dolphin,” roam in schools and covet the shade of sargassum beds. Accordingly, few experienced offshore anglers fail to thoroughly probe every visible, current-induced weedline in sight. Many a chicken dolphin has fallen prey to an erratically worked feather jig dabbled on the edge of a dense mat of seaweed. Big “bull” dolphin have heads like the shoulder humps of grown Brahma bulls. On the hook, they also behave much the same. Females don’t grow quite so large, but like their larger companions are far shy of petite after detecting a barb. Bigger fish tend to run in pairs, and sometimes travel on their own. Large dorado of 30 pounds and up are usually caught far offshore, often by marlin anglers who troll bubble-making “jet-head” lures that trail multi-colored soft plastic skirts. Dolphin-colored lures are, in fact, the baits of choice for a great many marlin fishermen. Apparently, large billfish like small dorado as much as we do. Dorado are indeed, beyond question, excellent eating. Red snapper have long been the mainstay of offshore “party boats” that accommodate large groups of fishermen. Few fishermen probe a rig, reef or wreck without attempting to catch at least one quality snapper. Red snapper are voracious feeders, and rarely hesitate to eat everything, from fresh dead squid to wiggling live baits. Most every seafood restaurant menu in the country verifies the red snapper’s ranking as a delicacy. Competition for the fish between commercial and recreational sectors is as intense as the market demand. Although not spectacular fighters, sow snapper are pugnacious pullers when fought down deep. Snapper get the equivalent of “the bends” (in humans, “decompression sickness”) when quickly cranked to the top. Accordingly, conservation-conscious anglers must properly puncture the creatures’ swollen air bladders (not the stomach, which often protrudes from the mouth) before releasing them to fight again. Minimum legal size in federal waters is 16 inches. Inside state waters, red snapper harvest is allowed year-round, with a four-fish daily bag limit and 15-inch minimum size. It’s highly advisable to check federal limits on all offshore species. Obviously, regulations can be complicated. Texas offshore waters host much, much more than the aforementioned four species, worthy adversaries such as the greater amberjack, yellowfin tuna, wahoo, blue marlin, sailfish, swordfish, various species of grouper and a dazzling array of sharks. All are monitored and managed, and for good reason. Gulf of Mexico fish populations are not inexhaustible. Despite years of notions to the contrary, sharks are no exception. Large and small, of differing varieties, sharks roam everywhere from chest-deep beachfront breakers to far beyond the Continental Shelf. Research has shown sharks on the whole to be very vulnerable creatures. Sharks are live-bearers, slow to reproduce but aggressively pursued, especially by commercial fishermen far offshore. Deep beyond the 9-nautical-mile boundary of state-regulated waters, multi-hooked “longlines,” exact a devastating toll on the much-feared but little-understood apex predators. Shark fin soup remains a tragically treasured commodity in some Asian countries. Fortunately, many U.S. sport fishermen now realize the situation and release most of the sharks they catch. Despite profound pressures, the waters of the western Gulf of Mexico remain a breathtakingly wild frontier. Those of us who have been there, and who live to go back, know that the blue-water realm only 30 miles or so from the beach is an unparalleled universe of its own. I’d even go so far to say that it’s out of this world.